It looks increasingly likely that this World Championship will go all the way to the last race in Brazil, and while finale showdowns have not been uncommon in recent years, the number of drivers still involved at this stage makes the current campaign something quite special. It wasn't so long ago that Michael Schumacher used to sign and seal titles in July, and yet as we head into September, five drivers are still in contention. Yes, even Nick Heidfeld can - mathematically, at least - come out on top, although I'd love to know what odds the bookmakers would give on that. To have four drivers within 16 points of the lead, and all with the performance and opportunity to win, is extraordinary. 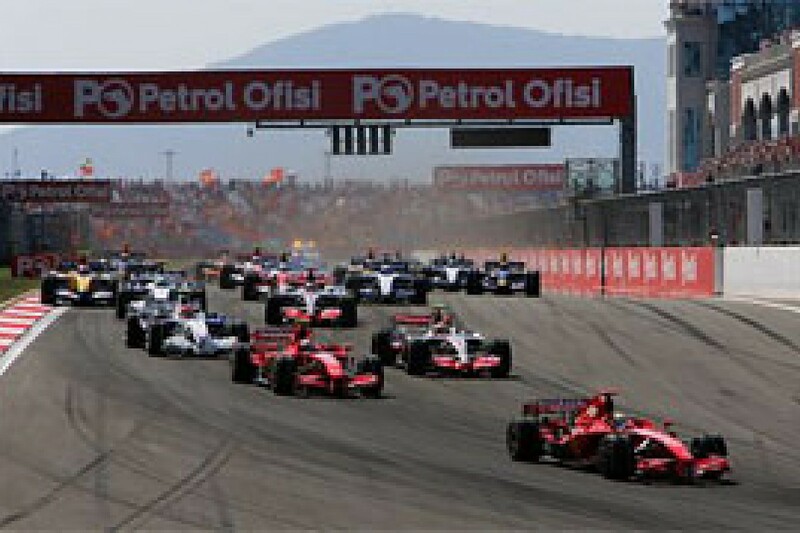 Perhaps the most impressive thing is that 12 races in, Lewis Hamilton, Fernando Alonso, Felipe Massa and Kimi Raikkonen have each taken three wins apiece. The other great arbiter of performance is qualifying, and the story is rather different there. Massa is clearly on top, with five poles to the four of Hamilton, two of Raikkonen, and one of Alonso. Of course, there are so many factors at play in qualifying now that pole isn't quite the yardstick that it was in the Clark or Senna eras. But nevertheless, it says a lot about Massa's performance this year. Bear in mind, too, that he had a car failure in Melbourne qualifying, and was screwed by a team operational error in Hungary, so the league table could well have favoured him even more. He's had some disappointments this year, but the pole-to-flag win was a further sign of how good Massa is right now. What made it all the more impressive was that he did it under strong pressure from his team-mate, and until his tyre problem, Hamilton was close enough to keep both Ferrari men on their toes. It was a faultless performance. It's not been a faultless year for the Brazilian, of course. He lost a few precious points when he was outfoxed by Hamilton in Malaysia, and lost a lot more when he missed the pit exit light in Montreal. The team should have warned him to look for it, but in such situations the onus is on the driver to be totally on top of the rules, and he wasn't. It's also worth noting that, in the mould of such as Ralf Schumacher, he tends to win from the front, getting his head down and turning in a consistently fast and tidy laps, rather than overcoming adversity in the way that the elder Schumacher so often did. Hungary was a case in point, where Felipe found himself trapped down the field and completely unable to do anything about it. He came home 13th, while in an identical car Raikkonen finished second, right on Hamilton's tail. But Turkey was one of the good days, when he really showed that he can get the job done. As noted, his qualifying performances have been very strong this year, and Turkey was one of the best. He was 0.217s ahead of Kimi, and as we were to find out on Sunday, he was carrying an extra lap of fuel. It's no exaggeration to say that he won the race with that qualifying lap, and even before he got back to parc ferme Kimi knew just how hard it would be to retrieve the situation. Felipe was also a lap heavier than Alonso, and one lighter than Hamilton. That turned out to be a great call by Ferrari, because had Massa been fuelled for one more lap in qualifying, everything else being equal, that extra weight alone would undoubtedly have given pole to Hamilton. The next job was to convert pole into first place at turn one, something that isn't always guaranteed. It helped that the 'wrong' side of the grid in Turkey is notoriously dirty and slow, but Ferrari had another ace up its sleeve. As we have seen more than once this year, the team has been able to make the option tyre [in this case officially the medium] work better than its main rivals. The two tyres were certainly very close, and it was one of those weekends when balance, feel and driver preference were just as important in determining the choice as lap time and degradation. Indeed, Alonso took a punt and did his crucial final qualifying lap on the harder tyre; a gamble that really didn't do him any favours. 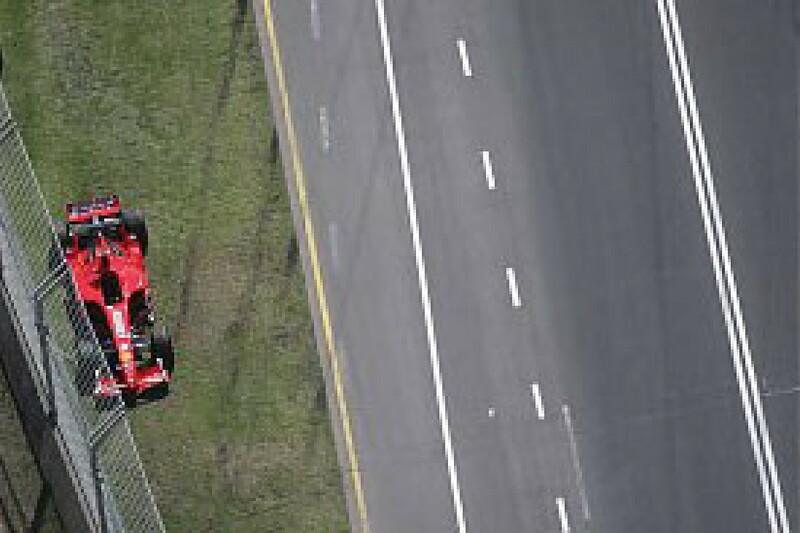 Having the softer of the two tyres fitted at the start does give a slight advantage off the grid, and that clearly didn't hurt either Ferrari driver - especially Kimi, who was able to out-drag Hamilton. "With the tyres, on Friday we made a long run on both tyres and it was pretty similar, with maybe just one or two tenths between them," said Massa. "We knew that Friday to Sunday the track changes a lot and the soft [ie medium] tyre should improve even more, so we took a bit of a gamble, although it was a pretty safe risk. "Especially for the start, we knew that the soft would be better and we had fantastic starts - Kimi overtook Lewis, and we had a very good race on the soft. "As we've seen a few times this year, our car tends to look after the tyres quite well in the race," said Felipe's engineer, Rob Smedley. "We knew that we would probably be able to fit the soft tyre, we knew that other people probably wouldn't be able to. So we were going to accept that advantage. "He was absolutely inch-perfect in qualifying, when it was very easy to make a mistake on the tyres as we saw other drivers were doing. "He did the right job, and that paid dividends. 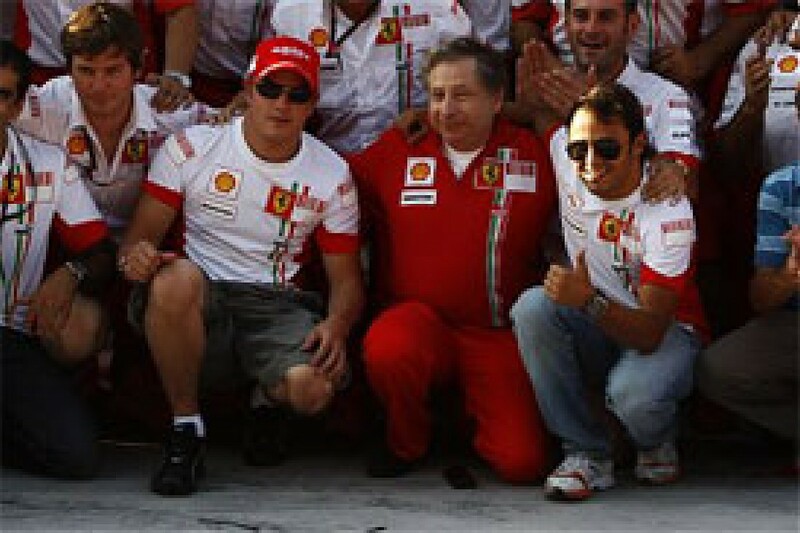 He was heavier than Kimi, and that was an added bonus. We were on pole and we had a reasonable amount of fuel in [the car]". Nevertheless, it was a relief to see him make it to turn one clearly ahead. "We knew that starting on the clean side, let's say, was going to play into our hands," Smedley remarked. "That's why it's so important to have the pole. We did that, and we got into the first corner first. How much of a relief is it? It's huge, to be honest!" After that it was a question of not making any mistakes, although having his team-mate rather than a McLaren behind, and the knowledge that he was stopping later than Kimi, made all the difference. 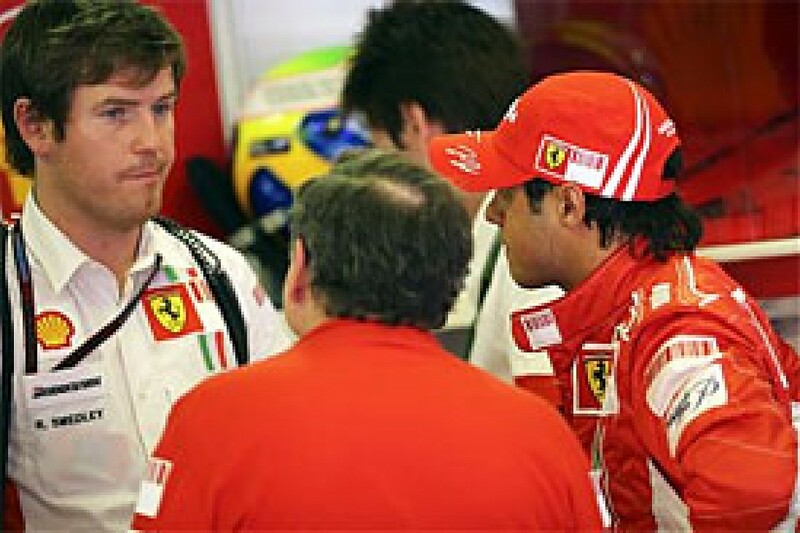 Having said that, Smedley denied that having a red car riding shotgun took away the pressure. "There's massive competition between the two. I think the reason why it's better to have your team-mate behind you is that you are going to get more points for the team ..."
Massa did have a little extra to think about before the second stop, however. "The gap was pretty similar throughout the stint, but then Kimi started to run two tenths quicker and I started to push again," he said. "Then I just made a small mistake going into turn seven, and Kimi was just able to close the gap completely. But the gap was okay to control, the balance was okay and the car was easy to drive, so it was not so difficult. But the small mistake made my life a little bit more difficult." It could still have gone wrong - traffic or some other glitch on the crucial in laps before each of the stops - but it didn't. This time the strategy favoured Felipe, just as it didn't in Magny-Cours. "As you saw in France," said Smedley, "it's very, very difficult to win the race. "They're both very evenly matched, they're both in the same car. The one with more fuel usually gets away with it in a situation like that. "Felipe was absolutely inch-perfect, he drove a fantastic race from the green light to the flag, absolutely not a single mistake. It was always close, and as I said the two drivers are very evenly matched, so it was always going to be a close fight. But fortunately, we came out on top in the end." The option tyre worked so well that the Ferraris also took them for the second stint, when they could have gone for the more conservative choice of the harder tyre. The decision was Massa's. "You're always ready with both kinds," Smedley explained. "And we were right there on the ball, just waiting. I asked him after about 12-15 laps what he thought of the tyres, and he was quite happy. He said the balance was getting better and better, there was more and more grip, and we were just picking up as we went along." Kimi did get closer at certain stages, but he was never close enough to make any move. "I think it was quite natural," Smedley said. "They were racing right until the chequered flag. There are absolutely no team orders, there never has been, but I think at that point both drivers start to look after their cars a little bit more, and it's just a case of that. That's why he probably dropped back." 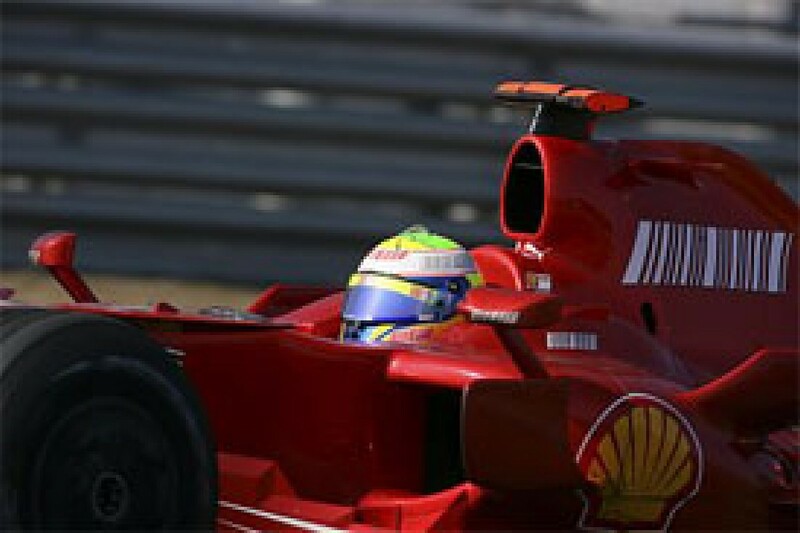 Massa's only real drama throughout was a highly unusual one - a plastic air vent on the top of his Schuberth helmet cracked and acted like an air brake. Not good for the neck, or the concentration, but he had the presence of mind to rip it off and chuck it overboard. So what next? Ferrari is close enough to have McLaren a little worried, but it has to keep the pressure on and perhaps force the British team into mistakes. Monza would be the ideal place for another one-two. "We've got to go there and win it, no other position now is acceptable," said Smedley. "If we want to win the championships, then nothing else is acceptable. You saw in Turkey that if we have a good day, and we have a good weekend, then it's all possible, it's all in the bag. "Monza is definitely a circuit that suits us very well. It's a very, very high-speed circuit, it's based a lot on aerodynamic efficiency, which we know our car responds to. We've got a new package there, as have McLaren of course. We've just got to go there and do the best we can." Spa and Fuji weren't on the schedule last year, but it's worth noting that Ferrari had the upper hand on rivals Renault at Monza, Shanghai and Interlagos last season. If that sort of pattern is repeated against McLaren this year, anything can happen. "It's well documented that we're going to places that we know suit our car quite well," Smedley agreed. "They're high-speed circuits, they're based on aero efficiency, they're places that are reasonably hard on the tyres, and hopefully we'll come out best." The question is, of course, whether at some point the team has to favour one or other of the drivers. We have to believe that won't happen until one is out of mathematical contention, and that might not become apparent until the last race or two. For now, Felipe and Kimi are fighting each other as much as the McLaren guys. Which of them keeps his head together more effectively and bends the team towards their will remains to be seen, but Smedley said that Massa kept his spirits high through recent disappointments, not least Nurburgring, where a tyre problem saw him humbled by Alonso. "Of course, he did get some flak for it," he said. "There was a certain issue with the tyres and the car and he couldn't actually win, but that's racing, you've got to get on with it. "You become demoralised when things are not going your way and you can't really see a way out of it. When you see there are certain things going wrong, and they're very clear-cut things, then I don't think you can become demoralised over that. "You've just got to say, well OK, I'm having a bit of bad luck, it's not a great period, but everything will turn around ..."